Did you know that Paterson is home to the world's largest collection of spoons? You read that right: the world's largest assembly of collectible spoons is housed in Paterson. I know! I had no idea, either, until Ivan and I visited Lambert Castle on Garret Mountain. We were there to check out the Civil War exhibit and while orienting us, the front desk volunteer happened to mention it. How could I have not known about this? How does the world's largest collection of spoons end up in Paterson? Pretty simple -- its original owner, Bertha Schaefer Koempel, started the hobby during her childhood in the city. Born in 1882, she'd amassed more than 5400 spoons (and a few matching forks) before she died in 1966. Friends and family members would give her souvenir spoons from their travels, and she knew some well-traveled folks. By the time she died, every state in the Union was represented in the collection, as well as a majority of of the world's nations. Definitely nothing like the cheesy tin commemorative utensils I remember seeing at souvenir stands in my youth, these spoons are amazingly detailed and beautiful in their own right. Most of those on display right now are lovely silver with nice designs and paintings on them, representing local scenes or noted personalities. Some are even enameled in jewel tones. Others have interesting add-ons like the mummy 'entombed' in a compartment in an Egyptian spoon. Mrs. Koempel donated the spoons to the Passaic County Historical Society in 1967, and with the exception of a few years during Lambert Castle's renovation, they've been on display there ever since. Only about 250 of the spoons are out at any given time, but the museum plans to rotate the collection occasionally so that all are eventually available for public viewing. Considering that no Civil War battle was fought in New Jersey, I've often found it difficult to relate to the conflict the way I do to the Revolutionary War. Battles for independence were fought not far from my grammar school, and I learned the names of local residents who participated, but I had no similar reference point for the War Between the States. That changed this weekend, when I discovered the stories of a handful of New Jerseyans who'd left Passaic County for the war, some never to return. A treasure trove of locally-significant Civil War artifacts has been lurking in Paterson, deep within the archives of the Passaic County Historical Society at Lambert Castle. The donations of county residents whose ancestors fought in the War, they're available for view at the Castle over the next few days as part of the 150th anniversary of the war. Honoring Passaic County's Civil War Veterans is a small but significant collection of uniforms, weaponry, documents, photos and artwork reflecting the four year conflict. Not only does it include battle gear, it features General Ulysses S. Grant's death mask and lapel ribbons marking the mourning period after President Abraham Lincoln's assassination. Visitors with local roots can also review a roster of Passaic County residents who served in the war to see if their ancestors took part. Most movingly from my perspective, many of the articles in the collection are traced directly back to a local resident who fought in the war. Battle becomes so much less abstract when you can relate it to someone who may have walked the exact Paterson streets you did earlier in the day. Looking at the uniforms arrayed in the exhibit, it's not hard to imagine a local soldier stopping by to pick up his jacket before going off to war. It led me to wonder what led them to enlist and their impressions of their experiences. Why, for example, was a Paterson grocer so moved by the cause that he sold his business and actively recruited scores of men to join him in battle? A reproduction broadside advertisement tells you some of Hugh Irish's motivation and practically shouts his patriotism... and you can read it for yourself at Lambert Castle. The exhibit closes on Sunday October 2, and Civil War reenactors from the Second Rhode Island Volunteers will be camping on the castle grounds. Stop by and check it out! Who's good and kind and has bridges named after them? Cross the Raritan River on Route 1 northbound, and you'll see a sign commemorating the Morris Goodkind Bridge you're traveling atop. Cross the Raritan River on Route 1 southbound, and you'll see a sign commemorating the Donald Goodkind Bridge you're traveling atop. I've been taking this route occasionally for my entire adult life, and it's only recently that I discovered the difference. Sure, I'd noticed that the two directions are carried on different spans, with the southbound bridge being several years newer than the northbound, but I never gave the name much thought. I knew the Morris Goodkind name, but I guess I assumed it covered both directions, and I assumed he was a notable New Jerseyan from colonial times. Discovering the Donald connection got me curious. I don't know of many colonial Donalds. So who are these Goodkind guys, and why do they get bridges named after them? The answer is quite simple, actually: they were both engineers with the New Jersey Department of Transportation and responsible for the design of the bridges that now bear their names. The older bridge, built in 1929, is much more graceful: concrete with arches beneath and commemorative plaques embedded at either end. I've never been able to read them because they're against the left-most lane and impossible to get to with your life intact; in more recent years they've also been sprayed with graffiti. There's a war memorial at the southern end, largely unreadable at highway speed. Originally called College Bridge, the span was named after the elder Goodkind in 1969, just one of his many accolades. He'd won a medal for excellence in bridge design from the American Society of Civil Engineers for the bridge's design and eventually became chief bridge engineer for the state highway department. The Pulaski Skyway is just one of the spans built under his leadership. Interestingly, he'd begun his career in subway design in New York City. According to the Encyclopedia of New Jersey, Morris believed that bridges were monuments to structural elegance and that unless a bridge was beautiful, the engineer had not given all that was expected of him. It's a shame that his son didn't (or perhaps couldn't) design the newer bridge consistent with that goal. A garden-variety highway bridge of steel and concrete, the southbound span was built in 1974 and named after Donald in 2004. Maybe engineering standards at the time favored that kind of design, or maybe it was more cost effective, but wow ... not really all that impressive-looking. The body of his work, however, warrants recognition. Like his father, Donald also made notable contributions to the state's roads and engineering discipline. He was also a trustee of the New Jersey Institute of Technology and co-founder of the state Consulting Engineers Council. You have to admit, there's a nice little symmetry to the father-son bridges. They show the tenor of their times, and they certainly get the job done. New Brunswick's reputation as a Revolutionary-era city is tempered largely by the presence of Rutgers University, one of the original eight colonial colleges. Essentially all of the period architecture is gone from the city's riverfront and dock area, obliterated by Route 18 and redevelopment over the past 30 years. However, history buffs and fans of the musical 1776 are well aware of the some of the more notable of the era's personages who visited during the war. Yes, Alexander Hamilton was there with his troops at a point... but the big guns are John Adams and Benjamin Franklin. New Brunswick was a stopover for them in August 1776 as they traveled from Philadelphia to Perth Amboy and Staten Island to meet with British General Howe. According to David McCullough's venerable biography John Adams, the pair were to represent America's side in a discussion of the recent declaration of independence from the British crown. The conversation ended, of course, with a stark refusal to surrender and thus rejoin the empire. The story of the night before the discussion is rather whimsical in nature and says a lot about the historic pair. Because accommodations in New Brunswick were mostly full at the time, Adams and Franklin were forced to share a room. Some even say that the pair even had to share a mattress. It wouldn't be surprising -- after all, inns of the day didn't exactly have the queen posturpedics today's hotels do. According to legend, Franklin spent much of the night expounding on the merits of keeping the window open. He'd published a theory on the benefits of fresh air, believing that people in closed rooms were more likely to catch cold from each other. Adams, on the other hand, feared the night air but eventually fell asleep to the sound of his bed partner explaining his beliefs. Fortunately, the inn where they overnighted, the Indian Queen Tavern, has been restored. Unfortunately, it's not at its original location at the corner of Albany and Water Streets, an intersection now covered by an entrance to Route 18. You can visit the tavern now at East Jersey Olde Towne in Piscataway, which is where I found it. 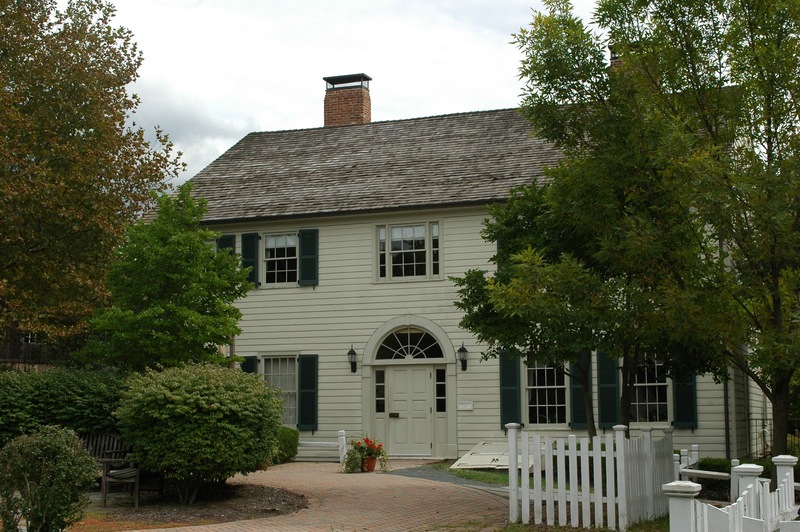 Olde Towne is a collection of historic and reconstructed homes and buildings from around Middlesex County and environs, all arranged in a tidy, walkable community off River Road. Though they feel a bit too tidily situated, the New Brunswick barracks next to a tavern next to a home and blacksmith shop... and a tiny square brick church.... a visitor quickly warms to the thought of them all located in one place. You could do a nice little study of East Jersey colonial architecture in probably a half hour. The tavern and the barracks, especially, caught my attention. Long interested in New Brunswick's colonial past, I took a look at the addresses and tried to place where the buildings had stood, in comparison to today's streetscape. Not surprisingly, both were fairly close to the Raritan, if not absolutely on it. The city had been a busy and productive port area, with lots of shipping and commerce. No doubt, it was quite a toddling town in its day. Small wonder that colonial luminaries had found their way there. The community is open from Tuesday through Friday and on Sunday afternoons; I guess they keep it closed on Saturdays due to the proximity to Rutgers Stadium. Unfortunately that's when I was there, so I didn't get the chance to check out the building interiors, but it's definitely worth another visit. The Indian Queen, at the very least, deserves more attention. 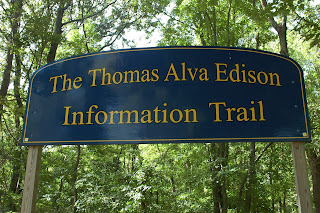 My lack of direction on the Edison Information Trail continued as I headed toward lunch. You see, I figured that since I was already so close to Route 27 in Middlesex County, I'd continue south toward Highland Park and make a detour to the White Rose System. It's not normally a difficult trip. Sure, there's a point in Metuchen where 27 makes a sharp 90 degree turn, but I've done it dozens of times. It shouldn't be a problem. The key word there is "shouldn't." For some reason unbeknownst to me (bad gyroscope? Mercury retrograde?) I made a wrong turn and somehow ended up on New Durham Road. This isn't good. My GPS is on the blink and the map was no help because I didn't have my reading glasses (danged presbyopia!). I was left to my innate sense of direction, which was suspect at the time, and a bit of good luck. The gods must have been smiling down on me, because I found myself back on 27 after five or ten minutes of driving through an unfamiliar part of Edison. From there I got down to Highland Park, did the appropriate flipdoodle turn to get to Woodbridge Avenue, and I was at the System. The White Rose System, for the uninitiated, is a classic greasy spoon with unbelievably good burgers. It's the late-night bellybuster of choice for generations of Rutgers students, past and present, and is steeped in legend. Depending on what you choose to believe, the guys behind the counter could be convicts on a work-release program and shackled together behind the counter. I never believed it, but the fact that they always seemed to be stationed close to each other at the grill and register did give the story the tinge of truth. I really didn't care as long as they kept up their usual pace: having my order ready and taking my payment two seconds after I got the words out of my mouth. The place is open 24 hours (or 6 a.m. to 6 a.m. Monday through Sunday, if you read the hours on the door) and as with most places like that, it draws its share of characters, from working joes to blitzed frat boys, depending on the time of day. to which some wag appended the R in the proper place. Rumor had it that the sign had been painted over several times, with the same misspelling each time. Today, the place looks a bit tidier, and they've gotten rid of that old sign. The menu has also changed, with some healthier options to the classic hamburgers and fries. When I was there, a young couple was splitting a large slice of carrot cake, which would have been unheard of back in the day. My faith was restored when the counter guy served a good helping of scrambled eggs and Taylor ham to one of the dine-in customers. I couldn't give you any details on the healthy choices because I didn't need to look at the menu. I ordered my usual: California cheeseburger, fries and a diet Pepsi. Service was a little slower than I was accustomed to, but the meal was ready in a reasonable amount of time. Rather than eating in the joint -- it was always too crowded to do that when I was at Rutgers -- I stayed with my personal tradition and brought it to the car. There's just something about that aroma drifting about the cabin. 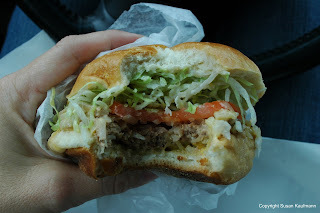 I've been going to a more convenient White Rose in Roselle, and while their Cali cheeseburgers are very good, I was wondering how the two would compare. (There are a few White Roses in central Jersey, all independently run, with varying menus.) The Highland Park burger is still better, maybe a little heftier, and soaks the bun just right. I'm smiling now, just thinking about it. The fries come in a generously sized paper sack and are straight cut and thick rather than the crinkle-cut I recall, but they still stand up well against the ketchup the counter guy had squirted onto them for me. It's good to know that even when things change, they can remain largely the same. They may have cleaned up the outside of the joint and added to the menu, but it's mostly the food I remember. The taste hasn't changed a bit. All in all, it's a good lunch, even if my arteries will be clogged for a week. Oh, and I made a salad for dinner. With Ivan away on a multi-day, out-of-state bird chase (it's migration season, after all), I was left to my own devices for Hidden New Jersey travels this past weekend. I decided to get on the Parkway and see where serendipity led me. How'd you like to change this bulb? The sign for the Route 27 exit led me to wonder how the renovation of the Edison memorial and museum in Menlo Park is doing. When I last looked, the website claimed the museum, at least, would be open this fall. It's worth a quick look, right? I got off the highway and made my way to Christie Street, site of TAE's first real lab, where the incandescent bulb was perfected. Nope, the museum isn't open yet, and the building is virtually empty, so I guess it will be several weeks, at least, before they cut the ribbon. 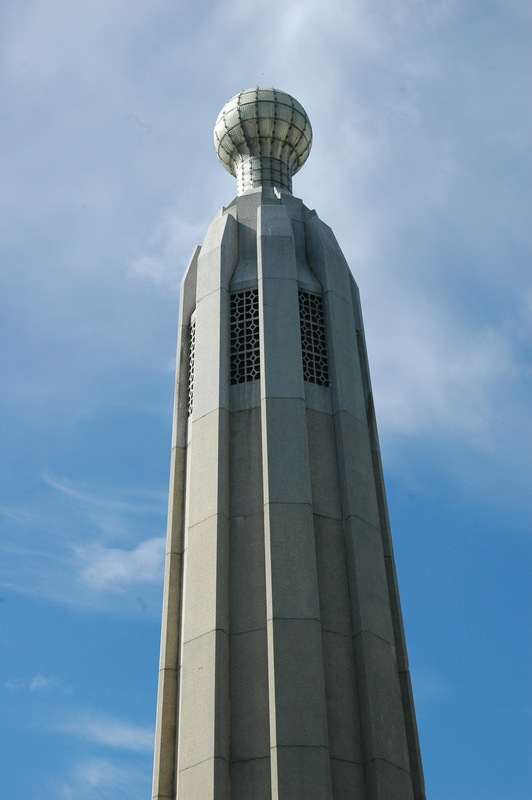 The memorial tower, cast from 1200 barrels of Edison Portland Cement, is still surrounded by a chain link fence and appears not to have much repair work done to it. No truth to the rumor, though, that the big bulb up top is being replaced with a compact fluorescent model. What's an Edisonian explorer to do? Hmm... across the street there's a marker with lots of information on the electric railway that was tested there, but reading that only takes a few minutes. 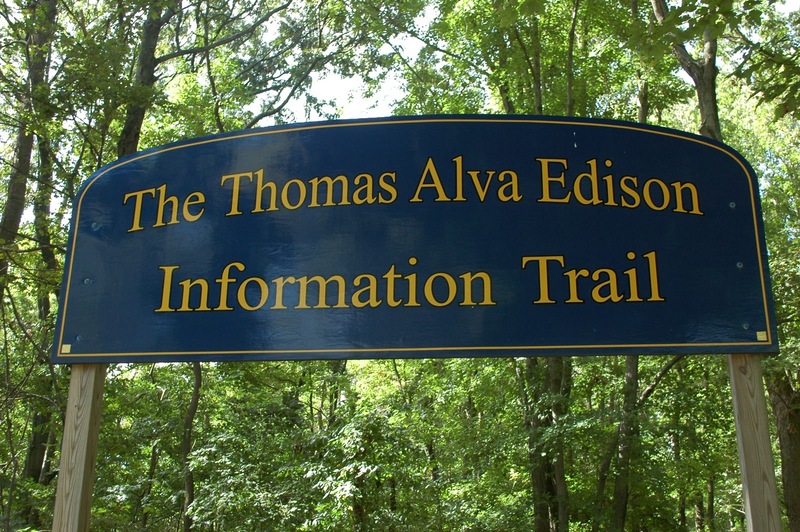 There's always the Edison Information Trail, leading into the woods behind the museum. I'd ignored it on earlier visits, and the explanatory posting was missing, but there was a big sign over the entrance. Apparently it was a youngster's Eagle Scout project. It's worth a shot, and I'll get a nice nature stroll in at the same time. Good enough. I tromped into the woods, expecting to find little plaques or something along the way. No. I did find a yellow disk emblazoned with a light bulb, nailed to a tree. A marker, perhaps? Good enough... I'll keep going. The trail seemed obvious enough. But still, I wasn't seeing any of the data that one would assume would come on an information trail. Abandon all hope. There is no information here. Then I came to a spot where there was no undergrowth. The trail disappeared until I saw the start of a path across the open area. I expected to loop back, but I ended up at a ballfield that, from the road sounds, was probably separated from Route 27 by a barrier of trees. Okay, I guess I made a wrong turn somewhere. Backtracking shouldn't have been that difficult. The wooded tract can't be any more than 10 acres, and there are houses nearby. How hard could it be? Well, plenty hard. There were, of course, no markers, and finding the other end of the trail on that big bare spot wasn't as easy going as it was coming. I made several wrong turns and ended up bushwacking through some underbrush. Joking to myself, I figured I didn't have to worry about ticks because there were no deer around. And then, as if on cue, I saw two deer. Great. I was close enough to some backyards that I could have taken them as an escape route, but I didn't want to deal with the embarrassment (or the police, if the homeowners were peeved). Instead, I pulled out my cell phone GPS and got a sense of where I was on the property. Fortunately the maps accurately showed where the museum and parking area are, and I was able to find my way back to the established trail after a few minutes. No harm, no foul, but I have to admit I'm a little annoyed with the Boy Scouts, specifically the Eagle Scout program. This project was well thought out, and if this Flickr stream is any indication, it came out very nicely, but unlike others I've seen, it wasn't kept up. I guess I should have known better -- caveat emptor and all that. Or maybe it was all planned ... like one of Edison's notorious practical jokes. Following up on our hawk watch post a few weeks ago, Ivan and I ventured to the Montclair Hawk Watch site this past Sunday to see what was in the skies above. We'd been fortunate to see a variety of raptors (including a mature bald eagle -- extremely awesome!) at the Meadowlands Festival of Birding, so we hoped that we'd have the same luck a few miles south and a few hundred feet higher in altitude. The Montclair Hawk Watch is New Jersey's oldest established hawk watch site, second only to Pennsylvania's Hawk Mountain in longevity nationally. Local birders started scanning for hawks from this site on the First Watchung Ridge in 1957, climbing up a rough trail from the neighborhood below. The site was eventually obtained by New Jersey Audubon and adjusted to make it more amenable to hawk watching. Today, viewers enjoy a large, flat, rock-covered platform with a sweeping view of eastern Essex, Bergen, Passaic and Hudson Counties and the New York City skyline. It doesn't take rappelling gear to reach the summit, but the way up to the platform is a bit more than a walk in the park. After parking in a small lot for the nearby Lenape Trail, we crossed the street and made our way on an unlabeled path into the woods. Soon enough, the path rises on a series of railroad-tie-and-dirt steps leading to a steep wooden staircase built into a wide crevice between two rock faces. Once you're up a bit, you walk atop a broad, slightly angled rockface until you get to a metal staircase that Ivan described as a pool ladder. It's more substantial than that, but you get the idea. The afternoon of our visit, a handful of other birders were already up there, chatting while keeping a keen eye out for hawks and others on the horizon. I learned that the best way to spot is to take sweeping views horizontally across the vision field through your binoculars, then moving down to the next plain and zag across the next lower field. The lulls between sightings create opportunities for conversation, and it's a friendly crowd, so it didn't take long before I felt comfortable calling out a sighting in the distance. I didn't necessarily know what I'd spotted, but others didn't take long to voice their theories until a consensus was met. While we were there, a decent showing of birds came by, including plenty of sharp-shinned hawks, some osprey, kestrel, merlin and even a bald eagle. I always get a big kick out of watching them soar -- they look as if they're having so much fun (I know I would be if I were them), and being at a 500 foot elevation brought them so much nearer than you'd generally see them. Some of them even circled above the platform, giving us a lovely view of their undersides. The watch season is just gearing up, and broad-winged hawks should be making their appearance in kettles (large groups) next week if experience is any indication. Other species will take up the march over the next two months, until migration is largely complete in November. Stop by and check it out for an hour or two -- I guarantee you'll gain a new respect for those large birds that we often see as just specks far up above us. On our recent trip to National Park in Gloucester County, we found a little-known Revolutionary War site -- the Red Bank Battlefield. Not to be confused with the town of Red Bank in Monmouth County, this field was named for its naturally red soil and earned its name through a courageous, patriotic stand. 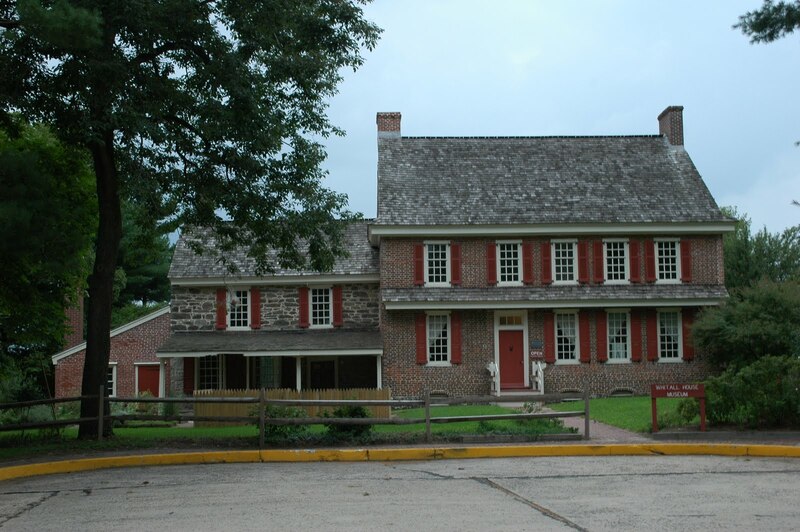 Today, the city of Philadelphia takes several miles of the Delaware River coastline, but in revolutionary times, the community was a lot smaller. The site that's now National Park was several miles downriver, making it a good location for a fort to protect the vitally important city and its port from British invasion. For that reason, in 1777 the fledgling United States built two forts on either side of the river. 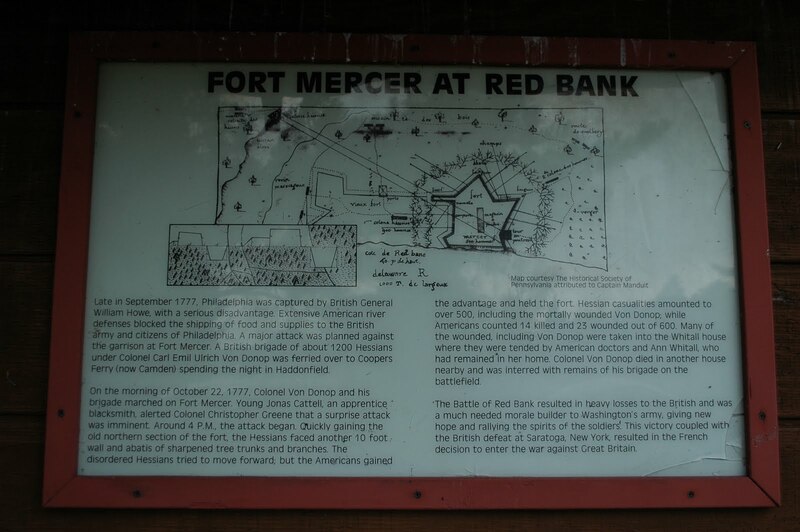 The one on the New Jersey side was named Fort Mercer, after Brigadier General Hugh Mercer, who'd perished during the Battle of Princeton. Later that year, however, the British occupied Philadelphia via overland march, and General Howe sent about 2000 Hessian troops across the river via Haddonfield to destroy Fort Mercer on October 22. A land-based attack wasn't expected, but the fort was prepared to a degree: Washington had already sent two Rhode Island regiments for defense. When they refused to surrender, the Hessians responded with a broad cannonade, attempting to breach the earthen works protecting the fort. Once they'd made a hole in the wall, they expected the Americans would either surrender or flee, but instead the patriots responded with what was described as shower of musket fire and grape shot. Several hundred American soldiers defended their ground fiercely, killing, wounding or capturing nearly 400 Hessians and forcing the remainder to retreat. U.S. casualties were relatively few, with 14 killed and 23 wounded. The victory, though relatively small, was a morale builder for the new country, with one observer describing it as "one of the most glorious stands ever made by patriots fighting for home or country." The satisfaction was short lived, as General Nathanial Greene ordered the fort abandoned and destroyed after Fort Mifflin was taken by the British. Today, the fort's earthen works and a few cannons still remain among the memorials to the bravery of the patriots who defended the fort. You can also check out the nearby home that served as a hospital for soldiers on both sides, including the Hessian commander Count Karl Emil Kurt von Donop, who died from his battle wounds. The house's owners, James and Ann Whitall, were observant Quakers, and Ann tended to both the Hessians and Americans. While being eminently humane, Ann apparently didn't put up with those who commented on the crowded conditions in the makeshift hospital. She reportedly told them that they should "not complain who had brought it upon themselves." Those who died during or after the battle were buried nearby, giving rise to eerie goings-on. According to legend, some of the burial ground was close to the banks of the Delaware, and the inevitable erosion exposed the bones of the dead. Mischief makers would come to collect the bones and sometimes would rap them against the Whitalls' windows, until Ann had her sons collect the unearthed bones and reinter them in a more secure area. We didn't see any bones or ghosts while we were there, just the house, memorials and a nice picnic and recreation area. No word on whether any dispatched Hessians stop by the picnickers to ask to borrow their Grey Poupon. Between Hurricane Irene, the aftermath and the cleanup, many of us are ready for a bit of fun and relaxation. This weekend's Meadowlands Festival of Birding might be just the ticket if you're up for some outdoors time and an eye-opening experience in one of the state's recovering natural environments. New Jersey Audubon, Hackensack Riverkeeper and the New Jersey Meadowlands Commission join forces to organize the annual event and encourage folks to experience nature in the region. DeKorte Environmental Center in Lyndhurst is home base for Saturday's activities, and the site of several workshops and a keynote talk from America's most prodigious birder. Sandy Komito holds the record for most bird species spotted in a single year, with well over 700, gained through extensive travel. His achievement is the basis of the upcoming movie The Big Year. Saturday's options also include hikes and boat rides at several locations within the Meadowlands district, including the Mill Creek Marsh trail we featured on Hidden New Jersey last month. Experienced birders (including Ivan) will be on hand to point out interesting avian visitors, with migrants sure to be on the list of birds spotted for the day. You're covered even if you don't have optics of your own -- binoculars will be available for loan. Sunday's events occur at several notable birding spots in the greater Hackensack watershed, including the Celery Farm, Garret Mountain, Palisades Interstate Park and Laurel Hill County Park. Be sure to check out the website for additional details, and how to pre-register for the boat cruises and paddling tours.